In collaboration with choreographer Daria Faïn, composer and 2019 Van Lier Fellow Anaïs Maviel will offer a solo performance incorporating material that has nurtured her practice thus far. 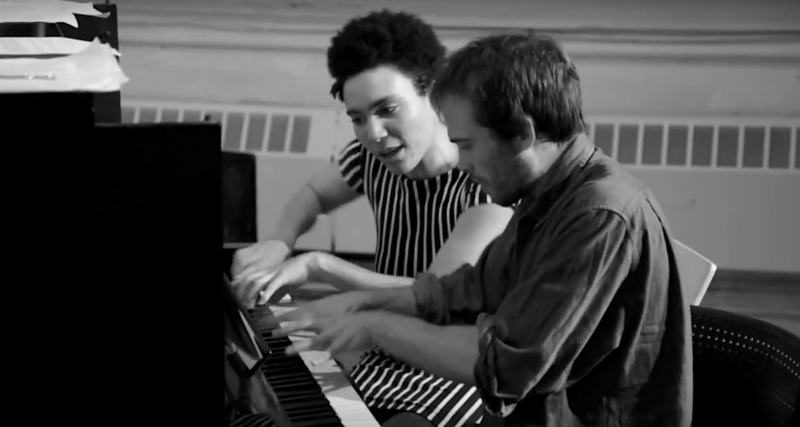 Designed as a performative ritual establishing a throughline between loneliness and relation, body, time and space, self and tools and machines, the night will transition into a duo set with pianist Sam Yulsman. Maviel and Yulsman’s collaborative work explores cyber poetics, performance roles, and magic. Alone together, in relation to the void, in relation to particles, conscious and subconscious, they will present a cyclic exploration of timescales and the possibilities of relation – ancient to future, physical to virtual, sacred to cyborg. 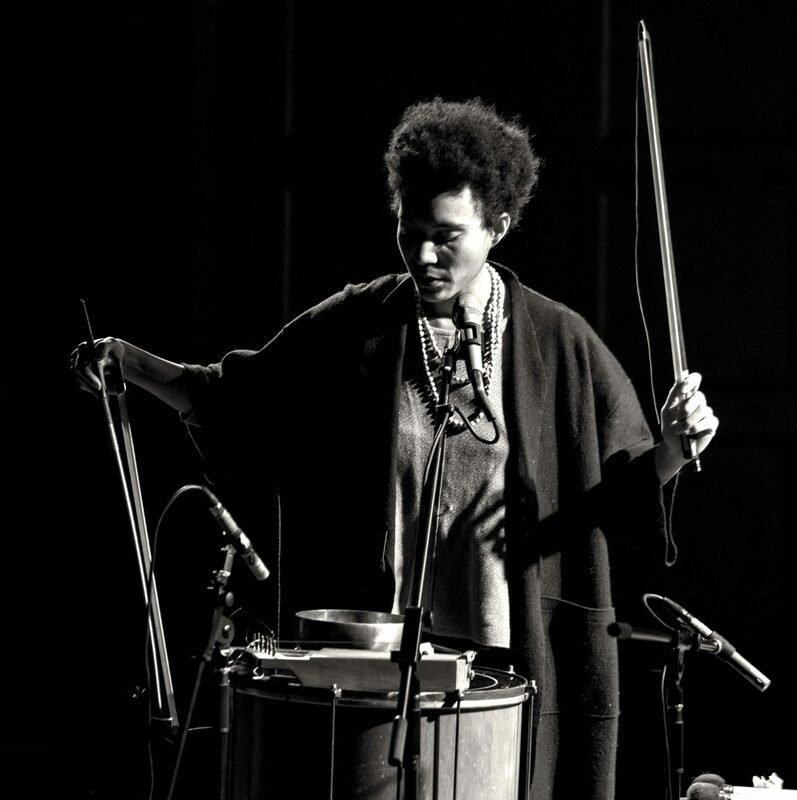 Anaïs Maviel is a vocalist, percussionist, composer, music director, and community facilitator. Her work focuses on the function of music as essential to settling common grounds, addressing Relation, and creating a utopian future. Inspired by Edouard Glissant’s reflections on Creolization, she has associated her practice with the inextricable currents that move spaces and people between times and lands. The contemporary context of re-formulation of self, reality and social structures led her to question the use of language, and to explore its vibratory essence in music. Involved at the crossroads of mediums – music, visual art, dance, theater and performance art – she has been an in-demand creative force for artists such as William Parker, Steffani Jemison, Daria Faïn, Larkin Grimm, Shelley Hirsch, Mara Rosenbloom, Melanie Maar & La Bomba de Tiempo – to give a sense of her eclectic company. As a leader she is dedicated to substantial creations from solo to large ensembles, music direction for cross-disciplinary works, and to expanding the power of music as a healing & transformative act. She performs extensively in New York, as well as in North, Central & South America and Europe. Her solo debut hOULe, out on Gold Bolus Recordings, received international acclaim and she recently released an eponymous album with carnivalesque duo DIASPORA. With a Masters Degree in Aesthetics (Literature, Arts & Contemporary Though – Paris VII Diderot University), she focused her scholarly works on Afrocentric paradigms of Creative Music as utopian alternative politics. 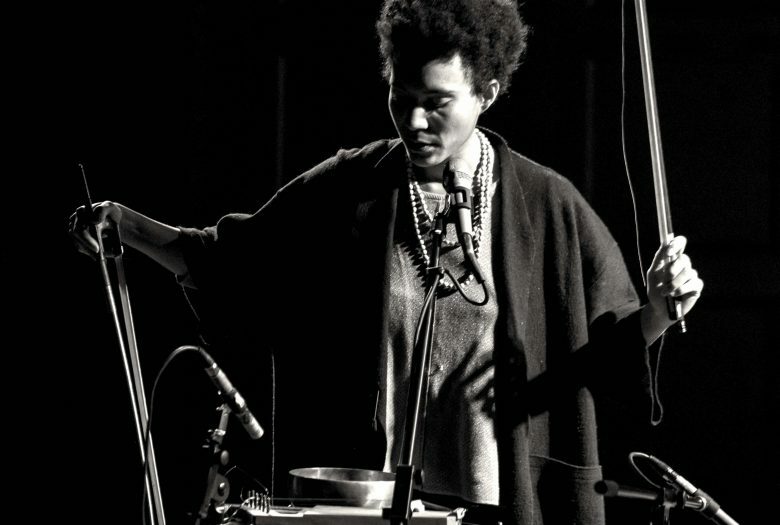 Anaïs Maviel pursues essay and poetic writings as part of her artistic inquiry and published a recent article in French magazine Revue et Corrigée, interviewed by bassist and collaborator Maxim Petit about the stakes of multiculturalism in contemporary music. Recent achievements also include: Co-Music Director for NOISE, a new musical by César Alvarez (Public Theater, NYC, 2018) Full length work Metadire premiered by Cross Times (Roulette, NYC, 2018) DIáSPORA eponymous album release on São Paulo based label Hérnia de Discos as the culmination of a South, Central & North America tour in partnership with Chiquita Magic (Argentina, Chile, Brazil, Colombia, Peru, Mexico, United States, Canada, 2017-2018) Composer, Music Director & Performer for “Mayday Heyday Parfait” in collaboration with the Commons Choir, Daria Faïn, Robert Kocik & Darius Jones (BRIC, NYC, 2017) Lectures & Master Classes at UNILAB – University for International Integration of the Afro-Brazilian Lusophony (Redenção, BR), MAMAM – Museum of Modern Art Aloísio Magalhães (Recife, BR, 2017) & Espacio Fundación Telefónica (Lima, PER, 2018) Composer, Music Director & Performer for Urban Bush Women’s Summer Leadership Institute “Undoing Racism” final performance, Kumble Theater, NYC, 2016. Daria Faïn is an acclaimed New York director and choreographer originally from Antibes, France. Her work fuses her European cultural background with three decades of practice in Asian philosophies of the body, American dance training as well ancient Greek theater. From this diverse background, Faïn has developed a unique movement and performance approach. She studied the classical Indian dance form Bharatha Natyam for five years in Paris with Amala Devi and in Madras, India with Swarnamuckie (State dancer of Tamil Nadu, 1982). In India, she also studied the co-relationship between this classical form of dance and temple architecture. She was deeply influenced by her work with the Butoh-based artist Min Tanaka. With a grant from the French Ministry of Culture she studied at the Graham School in NYC from 1984 to1986. She has been certified in the Alexander Technique since 1991, and has been an instructor of the Universal Healing Tao (Mantak Chia Chinese Chi Kung University) since 2001 and studies Martial Arts with Master Allen Frank from 2007-2010. Faïn has also extensively researched the reciprocal influence between architecture and human behavior and has given lectures on Swiss-born architect and urbanist Le Corbusier. Over the years Faïn’s choreographic research has led her to work with people with mental illness, the developmentally disabled, and blind-deaf individuals, leading to a complex understanding of the body as an endless resource of knowledge. Over the course of her career, Faïn she has presented 17 evening-length performances and numerous other short works, installations, durational performance and improvisations. She founded, designed, and built the multidisciplinary arts center and performance space Atelier Trigon with architect/poet Robert Kocik in Paris in 1990, and served as its Artistic Director from 1990-1994. In 2006, with Robert Kocik, Faïn co-founded The Prosodic Body: a new field of research that explores language as sound, embodiment and utmost expression. In 2008 they also co-founded The Commons Choir, a core and variable cast of roughly 30 singers, actors, composers and people In New York, Faïn’s work has been presented and commissioned: by BRIC Arts | Media House (AIR 2015-2017), Gibney Dance (2014), The Poet’s House and River to River Festival (2014), New York Live Arts (2013), Dance Theater Worksop (2011), Danspace Project (2006, 2008, 2010), The Lower Manhattan Cultural Council (2008, 2010, 2014), The Kitchen (1996, 2004), Movement Research (1996, 2001, 2006, 2008, 2009, 2010), The Rubin Museum (2008) and The 92nd Street Y (2001). Sam Yulsman (b. 1990) is a composer, pianist and multimedia artist from New York City, whose music spans a wide range of musical idioms. He has performed and/or recorded with artists including Ryan Muncy, Peter Evans, Biliana Voutchkova, Tyshawn Sorey, Chris Heenan, Anaïs Maviel, John Colpitts, Art Lande and Joe Morris. Currently, Yulsman performs regularly as a member of Brandon Lopez’s trio “the Mess”, and co-directs “Little Moments of Invisible Death” – a multi-media performance installation, designed and performed in collaboration with Martin Hiendl. As a composer, Yulsman’s work explores an array of materials and approaches to sound, ranging from choreographic treatments of gesture and interaction, to explorations of repetition, and circularity. His compositions have been performed by Ostravská Banda, Ensemble Korea, the New York New Music Ensemble, Rage Thormbones, JACK Quartet, Wet Ink, Loadbang and Mivos Quartet. Anaïs Maviel is a 2019 Roulette Van Lier Fellow. 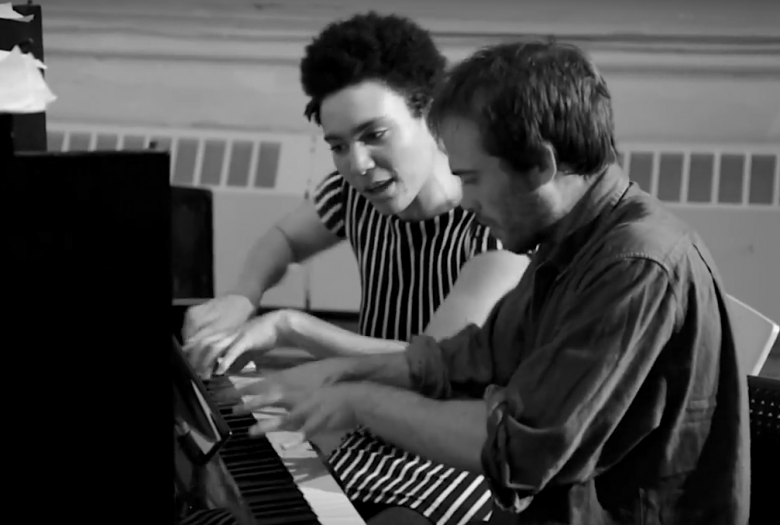 This duet is made possible by the Edward and Sally Van Lier Fund of the New York Community Trust.